Volunteers are one of the center’s most important resources. They represent a broad spectrum of the community and include business leaders, civic groups, high school and college students, parents and family members of our children, Delta Gamma area alumni and friends in the community who express interest in volunteering for the center. Volunteers give their time to serve on the board of directors and various board committees; help with special events, child care, building maintenance, family support activities, administrative work and much more. Meeting the mission of the center is possible in part because of the extraordinary commitment of the 575 plus volunteers who average well over 5,000 hours a year of service. Volunteers who give 10 hours of service a year are invited to the annual recognition dinner. Click here to learn more about volunteer opportunities, or click here to fill out the online volunteer application! If you are interested in volunteering, please contact us, at 314-776-1300 ext. 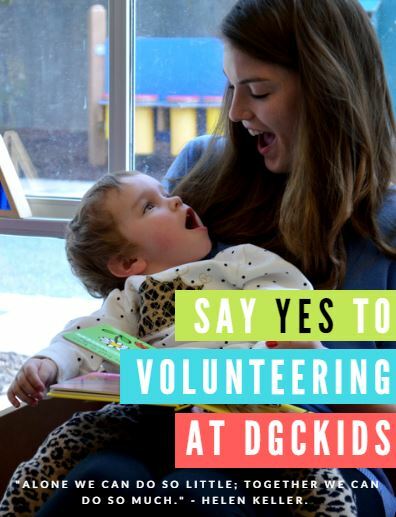 108 or volunteer@dgckids.org. Medical Professionals — In order to hold some of their group activities, overnight camps and bike rides they need to have licensed medical personnel present (Nurse, Medics, Physicians, NP, PA) to assist in the event of an injury, or required medication dispensing (physician authorized). Click Here for more information. GRADS Volunteers — GRADS (Group Recreation and Developmental Support) Groups GRADS groups serve school-age youth who are blind or visually impaired to help children develop friendships and social skills, increase independence, and promote participation in a variety of community activities. They meet one Saturday each month during the school year. During their monthly meetings, participants experience a wide variety of community and recreational activities, discussion groups, arts, and much more. Children can participate in a GRADS group from the time they transition from early intervention services at age three through graduation from high school. Click here for more information on the GRADS group! Buddy Builders — Volunteers are needed the first Wednesday of the month from 10 AM to noon to provide classroom support and childcare assistance to children ages 3 months to 36 months. Office Rescue — Miscellaneous administrative activities for the development office, and other administrative jobs as needed. Childcare — For family support activities or center-based activities. Outreach — Ability Awareness, the center maintains an active presence in the public school system, educating children about the abilities of people who are blind or have a visual impairment.